We are passionate about helping our members become the best they can be. We continue to be amazed by the incredible benefits our students see in their health through the power of yoga and we constantly seek to find ways in which to extend these benefits. Many of you will know that we expanded our offering to encompass your inner health through the introduction of our in-house nutritionist and stocking the incredible Wild Nutrition supplements. We have been long-time lovers of Wild Nutrition, but even so, we are repeatedly astonished at the outcomes seen by our members and instructors. So much so that we would love to share some with you! We all know the importance of a healthy diet to your health and wider wellbeing. However, we have been struck at the precise pinpointing of particular health concerns and symptoms and their nutritional ‘answers’. Alongside our nutritional workshops, we’ve seen an increasing number of both members and instructors trying the supplements and experiencing some astounding results. How do they differ from other supplements on the market? Wild Nutrition is the UK’s original producer of FOOD-GROWN supplements. These are created in a way which encourages your body to absorb their nutrients in the same way as it would food. This is in contrast to the traditional and more common high-dosage tablets of compacted powders. Studies have, in fact, shown that FOOD-GROWN vitamin C was 1210% more absorbed in the body than isolated ascorbic acid. Our Detox Flow instructor Charlie had been dealing with her menopausal symptoms with HRT. This was ineffective and she was suffering from joint pain, fluctuating emotions and severely diminished energy levels. Over the years she has tried a variety of supplements with different degrees of success. However, since trying the Wild Nutrition, she has stopped taking the medication completely and her symptoms have subsided. “After using HRT for 9 months I had felt no easing of my symptoms. In fact, if anything I felt even worse, as my body has never been able to cope with any form of drug. 2 months ago I decided to make the switch over to Wild Nutrition supplements and the results have been extraordinary. I have used Wild Nutrition’s Menopause Supplement, B Complex Plus and Ashwagandha Plus. Incredibly I experienced absolutely no withdrawals from the HRT. In fact, my bones and muscles feel like they have completely changed in mood and my emotions and energy levels are on much more of an even keel now. I’m feeling like myself again, with far more energy and a lot less stress. We think she likes them! Another of our wonderful members, Justine, has tried a few different brands over the years but never really found ‘The One’. Now that she’s discovered the Wild Nutrition range, she has enthusiastically tried out a number of different supplements. Her favourite by far was the Cleanse. “I did the Cleanse in January as way of kick starting the year and ridding myself of those indulgent Christmas excesses. The results were remarkable: my stomach felt so calm, with no hint of swelling or bloating. My skin improved and, most importantly for me as an insomniac, I slept better. Result! Frustratingly for Justine, she has been laid up following a foot operation. We hope that once she heals up she’ll be able to get back into the yoga and supplement habit to get back into peak condition. Why not try Wild Nutrition for yourself? We have loved travelling on these inspiring journeys alongside our members and we are excited to share the experience with many more of you. From fertility issues, women’s health, gut health, stress and anxiety and general wellbeing, there are so many ways that Wild Nutrition can help you. Our team will be delighted to chat with you with any questions you might have and to make recommendations on the supplements that might be right for you. 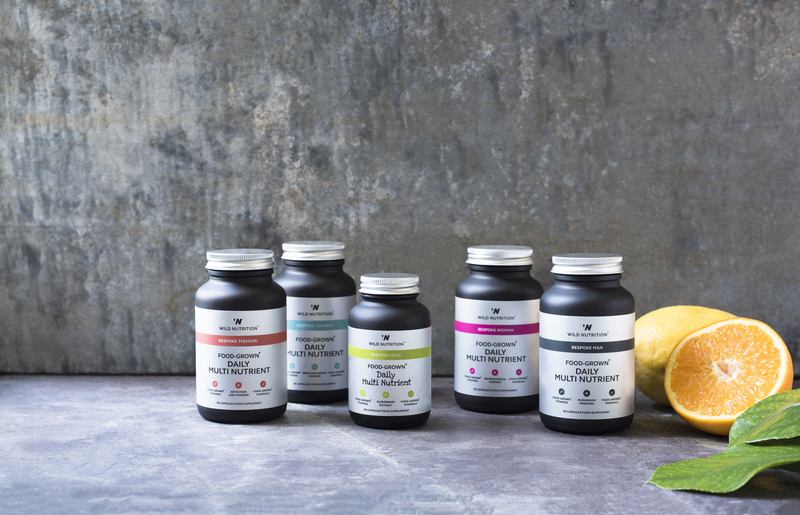 We stock the full range of Wild Nutrition products and are more than happy to sit down and chat through their individual benefits and to find one that is the perfect fit for you. Alternatively, give us a call on 01252 715933.